Maurizio Sarri arrived at Stamford Bridge as a manager that had never won a trophy in his career. His appointment, purely because of that fact, raised a few eyebrows. Yesterday, as Leicester City strode into SW6 and provided the kind of performance that was begging for Sarri to implement a Plan B, with Plan A having obviously failed, there was an air of resignation among the Chelsea faithful. In typical Chelsea style, the unpredictability returned and there are now doubts emerging that suggest Sarri isn’t going to break his trophy duck with us. “We played well for 55 minutes. “I think that, of course, in some situations we were unlucky but we could have done something better. Remind me again just when did Leicester score? As for playing well for 55 minutes, what the hell is that all about? The more I watch Chelsea these days the more it’s become obvious that we’re great at passing the ball around but the pace at which we move the ball forward is lacking, count how many times, by the time we’re near the opposition area, how many men they have behind the ball. No wonder we appear to be floundering at times, we’re being crowded out! I said it at the beginning even when we were unbeaten that Sarri looks like a manager with no ambitions. He is so much disillusioned with Liverpool and Manchester city. He blind to the fact that Tottenham is a threat, Arsenal is a threat and even Manchester United is a threat. By the time he wakes up from his slumber Chelsea will be finishing the season in sixth position. Watch the game against Leicester yesterday, there was no pressing from Chelsea players, no desire to get the ball back once they lost possession, instead, Leicester players looked hungrier. Sarri needs to change things quickly. The fact that fans are also no longer commenting on this forum indicates that Sarri is not inspiring anybody. I may be wrong but to be honest his lineup is always known and in many cases leaves many fans discourage. Alonso,Willian should be drop 4rm our team.I hv never seen a left back soo weak like Alonso before n Kante should return to his favourite positione period.Our coach also don’t have winning mentality..
Was trying to avoid mentioning names but truly Willian and Alonso have no relevance in the Chelsea team any more. To some extent even Giroud no longer have the sparkle. I don’t know why most of you are blaming Willian for Chelsea’s woes. I think Willian works very hard and he gets substituted the most when he should be staying on the pitch. Pedro was a disaster yesterday and Sarri left him there. Excuse me? Giroud, Loftus-Cheek, what did they do? Can you seriously compare Liverpool’s Shaqiri and these jokers? Sarri’s formation stinks, his displacement of Kante to some obscure position leaves me absolutely livid. We have seen it all. Get beaten by Spurs as if we are a mid-table team. Being beaten by the like of Leicester at home!!! Sarri out!!! He has proven more than enough what a loser he is. Mark my words: Sarri is taking us nowhere. Just let’s forget the top 4. With this coach, more humiliations are on the card for us CFC. Brace yourself guys! To be honest, I think we knew to give the coach some credit for turning a dull lifeless team under Conte to a passing , attacking team like this. However there is a limit to how many miracles he can perform with the squad. I think we need to buy him a good striker , Icardi, Huguian, Lewa etc in January . Someone who can strike fear into opposition defenders and actually score goals. Giroud is serviceable enough as backup. Also, that defensive line needs restructuring. Emerson should replace Alonso and Liuz or Kante should actually start in the place of Jorginho in some tough games like Tottenham. Starting either Luiz or Kante would allow us play both Barkley and RLC in attacking positions. Honestly a change in formation. Once in a while won’t be bad. Kante is playing out of position when he should be the holding midfielder. Where is Victor Moses? 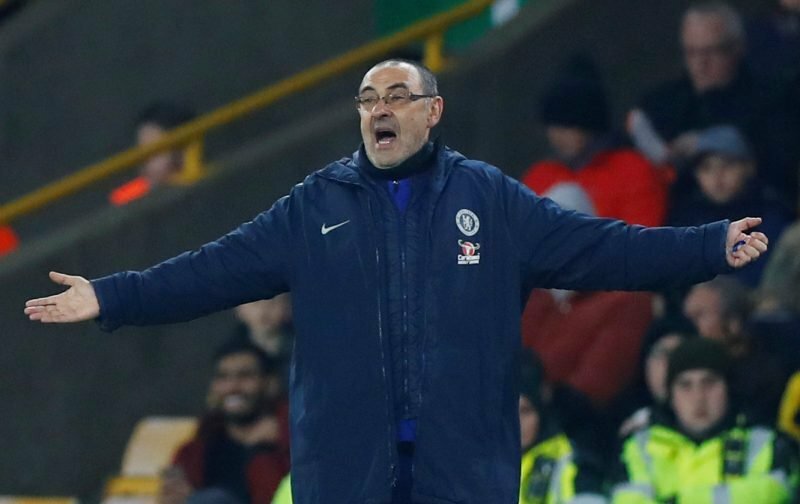 What about the Sarri “conundrum”? That banker accountant coach has never won a trophy in his career; what is he doing in London managing a top football club? well beaten by Spurs. Possession football and passing the ball around is not what win you games. That same team that we are having now, given to another coach, who is better than that loser called Sarri, will not perform the way it’s performing currently. Is Jorghino better than Fabregas? Why is he keep on being stubborn with a player that in reality CFC just don’t need. Jorghino isn’t better than Fabregas all day long. He must drop him now and come up with another plan to make that team perform in its full potential. We are tired of getting humiliated by the results the team is getting. The same Everton that we struggled to beat at home, got demolished by Spurs away. For me it’s Sarri out! Because I do believe our team can be going better results wise than what we are doing currently.